Market price gaps are events that successful traders understand very well. This is because when you really understand gaps; why they occur and how to trade them, you realize how powerful and opportunistic these events really are. At the same time, those who don’t really understand gaps tend to lose money when trading them. Gaps represent the ultimate supply and demand imbalance, which is key when attempting to identify market turning points. Whether we are talking about Stocks, Futures, Forex or Options, the logic and rules for gaps don’t change. Gaps happen when there is a significant supply and demand imbalance. Specifically, when there is more demand than available supply at the prior day’s closing price; the market will gap higher the following day as those buy orders need to get filled. When supply exceeds available demand at the prior day’s closing price, the market will gap down the following day. This is because the supply (sell orders) have to be matched with demand (buy orders) so price will gap down to where those orders are. Those buy orders will always be at the levels we call Demand. The strongest of those demand levels will have a gap with them which is why this article is so important. Let’s take gaps a little bit deeper so that you can have an edge in the markets and profit from key price gap opportunities instead of losing money to those who do have that edge. While we have a full section in our new Stock class that covers all the significant gap opportunities, today I will share one set of gaps that you may want to pay attention to, the Professional Gap. Later in this piece, I will explain where this gap gets its name from. For now, here are the definitions and proper action. 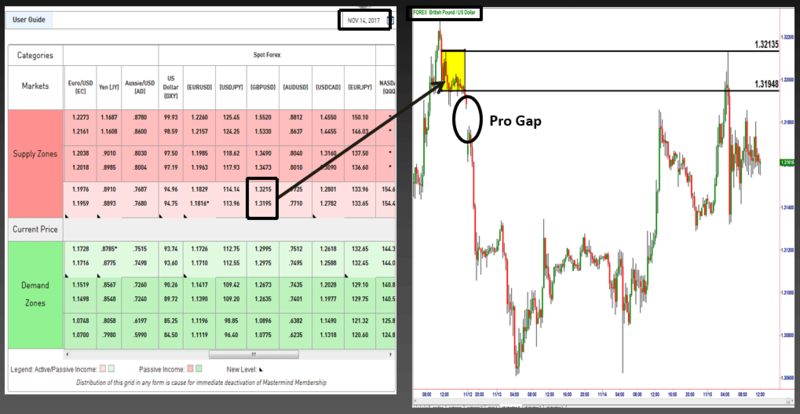 Professional Gap: A gap that occurs after a move in price, in the opposite direction of that move is a professional gap. These gaps occur at the beginning of moves and ignite them. They represent significant bank and financial institution supply and demand (buy and sell orders). Professional Gap High Probability Action: Join the gap on a pullback in price to the origin of the gap so long as the opportunity has a significant profit zone. In the GBP/USD chart above, notice the rally in price, then the basing (yellow box) followed by the gap down. This was a Pro-Gap. Our rules told us to sell short the next time price rallied back up to that level. Keep in mind the gap represents a strong imbalance so gaps offer high probability opportunities. There are other types of gaps to consider, but gaps then trading around the open of a market are the strongest. Typically, it is at the open of a market that prices are at levels where supply and demand is most out of balance. I witnessed and facilitated this handling institutional order flow at the Chicago Mercantile Exchange. Translating these areas of imbalance onto a price chart helps attain an edge over your competition. Only put your money at risk when the odds are stacked in your favor and the risk is low, which means identifying novice action in a market and taking the other side of the novice trade. Lastly, trading gaps is not for a beginner or novice trader. However, once you have attained the ability to quantify demand and supply in any market and any time frame, you are likely to find trading gaps a very opportunistic time to trade. After the release of economic data do you hold the position or square up? Is Consumer Credit a Concern with Rates on the Rise?